Thanks to the Unlimited Potential of the Internet and IFPO's aggressive leadership in electronic publishing, IFPO is able to bring new muscle to the large number of IFPO members who are interested in sports photography. Today's Sports magazine is an On-Line electronic publication with the capacity to promote and publish ALL of it's SPORTS Photographer's photos. A print magazine could NEVER MAKE SUCH a promise. 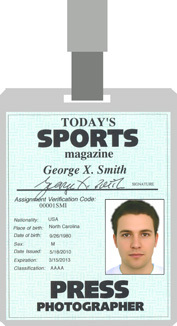 Why USE Today's SPORTS magazine Credentials? Because Sports Photographers are often turned away at events. 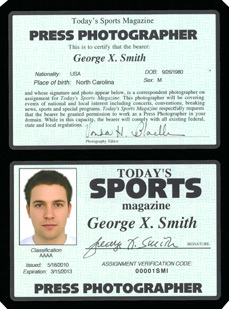 Today's SPORTS credentials identify you as ON ASSIGNMENT for Today's SPORTS magazine. Although your SPORTS credentials package arms you with a general letter of assignment effective in most cases, you may encounter officials who want an editors specific letter of assignment for that specific event on that day. Your package comes with this support and easy to use request sheets and a support telephone help number. Officials can check you out! Your Today's SPORTS package includes assignment verification using your unique Assignment Verification Code (AVC) by phone or fax during normal business hours. Optionally, world-wide 24 hour/day verification is available via our special internet verification site. Photographers who get published gain access! Today's Sports magazine's get-published program is unique. Each submitted photo will be published! Just make sure it is accompanied by the Today's Sports magazine's submission form (comes with your kit) and a small service charge of $8.00 per photo to cover the cost of scanning your image for publication. It is possible to guarantee publication because of the greatly optimized cost of publishing on the Internet. TODAY'S SPORTS Badge Card I.D. TODAY'S SPORTS Wallet Card I.D. TODAY'S SPORTS Offical Letter of Certification (placing you on-assignment for Today's Sports On-Line Magazine. Complete Assembly Instructions, laminating materials and Badge Clip. TODAY'S SPORTS Assignment Request Form and How to Use Your Sports Credentials.